Home Featured posts Why is time management important? Not having enough time seems to be a condition that affects people of almost all industries and walks of life. It doesn’t matter what your job is – chances are on a fairly regular basis you’ve wished you had more time to get everything on your list ticked off. Some people find managing their time easy: they’re organised and usually manage to get things done on time. Others find it more challenging. These people might struggle to visualise how long tasks are going to take, and end up getting behind – or they may find they spend lots of time on the time-consuming but less important jobs, leaving little time for the things that matter. At Evolution Personal and Corporate Development we’ve been coaching businesses and individuals for over 23 years in leadership, personal development and NLP. 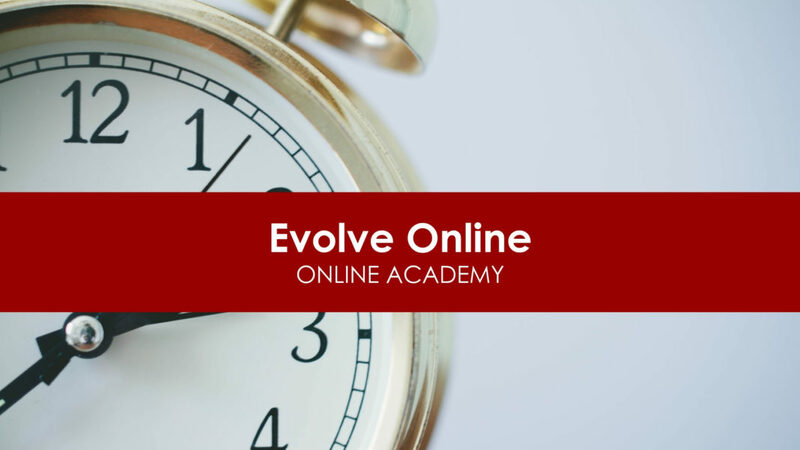 We recently launched Evolve Online, an online academy where Evolution founder Martin Crump will be delivering flexible, affordable online courses on time management and other useful skills. How do you know if you need to work on your time management skills? Regardless of whether or not you find managing your time easy, there’s always room for improvement. A quick review of the way you spend your time should reveal the patterns you fall into when working, and the areas where you could make changes to become more efficient. If you ever get overwhelmed with the amount of work on your plate, find yourself running out of time, or just wish you had more time to spend on the things you enjoy (or earn you money), then it’s worth working on your time management skills. The benefits of good time management are numerous. Managing your time well will almost certainly improve the quality of your work. You’ll have more energy for the things that matter, and the people around you (whether clients, colleagues, family or friends) will benefit too. Better time management means more time with family and friends, and less stress and anxiety: no more lying awake at night worrying about all the things you still haven’t checked off your to-do list! Find user-friendly tools and apps (like time tracking software or project management platforms) that work for you. When it comes to apps, keep it simple: more apps do not necessarily mean better time management! Check in regularly with yourself. We’ve all been there: you attend a talk or read an article on time management, and come away fired up to be the most efficient person ever. Two weeks later, you’re back to your old tricks. Regularly checking in with a short course will reaffirm what you already know: that good time management will improve the quality of your work, and create less stress. The Time Management Toolkit is designed to work around a busy schedule. It’s broken down into modules that you can complete at your own pace; you can even watch the sessions at 2x speed if you’re really pushed for time. You can return to the course whenever you’d like, to re-watch modules or refresh what you’ve learned, and the course comes with downloadable course notes to help you implement real changes. The Time Management Toolkit is available for £49 from the Evolution Development website.